You must make reservations at least 5 minutes in advance of the time at Good Enough to Eat. 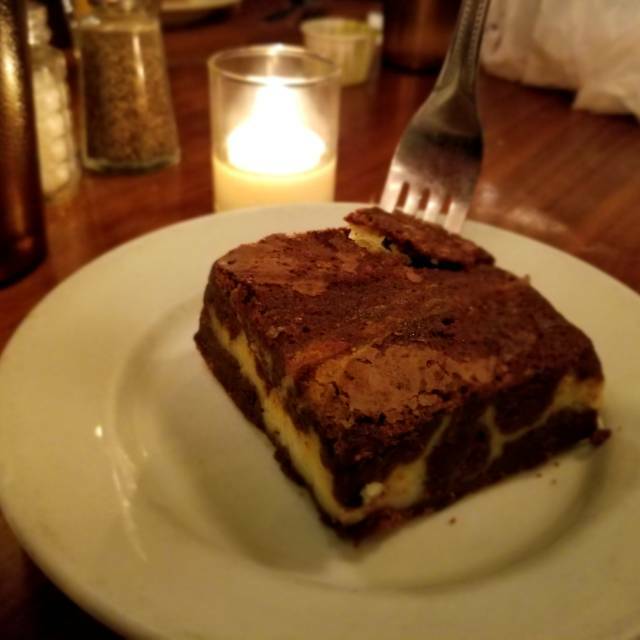 There is parking on 85th street and there is meter parking on Columbus Ave.
Good Enough to Eat has served American home cooking in the Upper West Side since 1981. Visitors from all over the world come to Good Enough to Eat to enjoy classic American food. They sit side by side with Upper West Side “regulars". The appetite for wholesome, authentic, traditional American food only seems to be growing. Please note we only take reservations for dinner,if you are hankering for breakfast, brunch, or lunch, please feel free to stop by. *Our omelet style is a traditional loose preparation. Tell your server if you prefer well-done! This was AWFUL. The table was disgusting, we watched them wipe the extra food on the table off onto the booth where we were to be seated. We went at 7PM for the Passover menu and by 7:15PM they had ran out of everything on the Passover menu. They did not apologize and they did not know what to do. They were just as confused as we were. They did not do anything to make up for it, charged us for our cocktails. we arrived at 730 for our dinner reservation and ALL specialty food items were 86d! we chose GETE for the Pesach menu and were very disappointed when we could not have it. and at that point was too late to get a res elsewhere. so sad. Noisy, disorganized and poor service. The servers were overwhelmed because understaffed. The music added to the cacaphony, which made conversation difficult. We sat for 20 minutes when finally requested a bread basket. Is the name of this restaurant supposed to be ironic? Nothing was good enough to eat. Whole place is run down including the kitchen. Never again. It is a good place to go on a weekday night -- quiet, which I like a lot. My meal was good -- not great but perfectly OK and I'd go back because there are not that many places where you can really have a conversation and eat decent food. Lovely staff and love the ambiance as well! The food was not good at all for dinner. Salad and guacamole were very forgettable. The meatballs were good. The wine list is ... below par. Maybe this place is a better breakfast/ brunch option? There’s always on line on the weekends. I’ll def try it again ... fingers crossed. The weekend prime ribs special was tough, tasteless and fatty. The strip steak was tender, but without flavor. The meat in the Quesadilla was tough. The best meal was the fried chicken which was both tender and tasty. We were there at 6:15 on a friday night. Place was empty. We waited over 45 mins for our food (a sandwich and chicken fingers). Waitress told us they take call intake out orders first before customers who are physically in the restaurant! Very good meal. The staff here is amazing! I work with children w/ Autism and the girl I brought can be quite loud at times. The wait staff and owners could not have been accommodating and friendly. Highly recommend to anyone. The food is great!! Staff was very accomadating and sweet. They made my young boys laugh and feel comfortable. We loved the onion rings. Everything we had tasted fresh and homemade. The service took too long on a very unbusy night. My entree salad never arrived. The soup was cold although tasty. My beef stew entree was more of a carb fest - there were potatoes in the stew, potatoes in the mixed veg, and a side of mashed potatoes. The stew itself was rather grisly and the gravy was lackluster. Made a reservation and had some subway trouble but I called and they were able to accommodate me even though I was late. Really nice people working there. Very cute place. Food is very good. Casual and quaint. Def would go back. What I remember is the strawberry butter. But in the evening, Good enough to eat is serving non-breakfast items. It was tasty and the services was good considering that the we came with a ton of people at the same time. The manager did warn us that our food might take longer than normal, which we appreciated. It's rare that someone offers that information. Overall the food was good enough to eat. We will go back, but this time looking for that butter. Quirky, friendly place to eat. Great menu, lovely home cooked food. Definitely worth a visit. Good Enough to Eat never disappoints! I read a review on Open Table recently that said the writer didn't like the food or service there. WHAT ALTERNATE REALITY RESTAURANT WAS THAT PERSON DINING AT? Let me repeat. Good Enough to Eat NEVER DISAPPOINTS! Never really on Upper West Side and wanted a simple delicious dinner with my dad. Friends from the neighborhood told me about Good Enough to Eat so I made a reservation...the food was so delicious. Comfort food done perfectly without being too heavy. I loved it and so did my dad. I have already told friends to eat there when they’re uptown! I was excited to try this place after seeing continuous lines out the door for both breakfast and lunch. We opted for dinner and they are reservation only for dinner. The place was dead for dinner. We went on a Saturday and their Friday -Saturday special is always prime rib. They were out (wonder how many times that’s happened before). Food was not worth the price and my dinner was dry and tasteless. My fiancée had an even harder time ordering considering he wanted the special and the kids meal is NOT worth the price. We were in a raining day before museum day. Food is really nice and the service really good! The restaurant advertised as having a vegan section of the menu which it did not. The food was sub par and the service was not good we arrived at 7 and didn’t get our order until after 8. I won’t be back. It was a birthday dinner for myself & 5 close friends. We were seated in the separate area and enjoyed the DE LICIOUS Food. Each person was very satisfied. My chocolate cake was wonderful. The service was excellent. Will return again!!!! This restaurant really went down hill. The service was terribly slow. The food was not great and there were flies everywhere. The food was inedible,. It used to be a different place, but that was years ago. First time going and the food is fabulous! Can’t wait to go back. Huge portions and the chicken pot pie is amazing! Good Enough to Eat was a convenient spot for dinner before Shakespeare in the Park, being only a ten minute walk to the park entrance on 81st. Our party of four enjoyed a round table to the side, which proved perfect for conversation. The atmosphere is cozy and interesting, with country farmhouse touches. While the menu is varied, there are not many options for non-meat eaters, but there are a lot of solid options if you are into comfort food and portions are generously sized. I had read on the website that all desserts were homemade and what I saw in the display case looked promising, but we were disappointed in the two we ordered to share. The seasonal fruit crisp had an inch thick topping that a knife could hardly get through and the German chocolate cake was very dry. 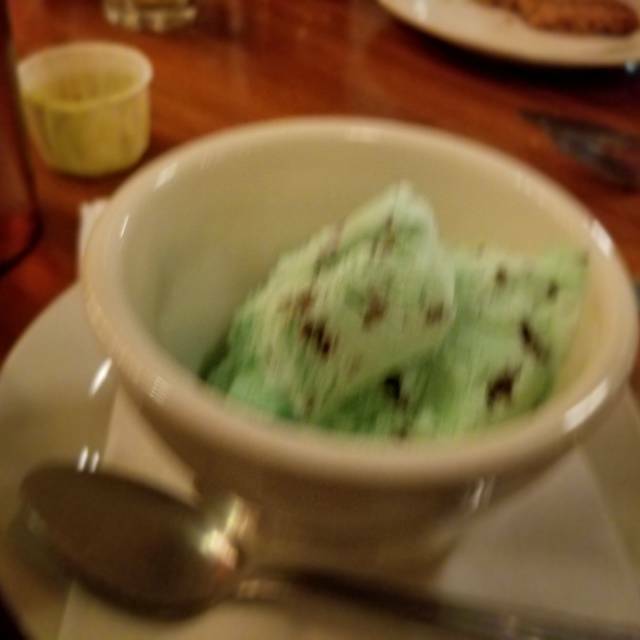 As other reviews mentioned spotty service, we made sure we were ready to order when the server came and did not have a problem getting to the park in time. This restaurant prides itself on 'farm to table' dining. I used to go there when they were on Amsterdam Ave and quite enjoyed them there. However, this visit with my grandson was wholly 'meh' to quote a 15 year old. The food had little flavor and had a pre cooked, re heated feeling to it. We took most of it home and then promptly threw it out. I had chicken pot pie - a few limp chicken pieces with dry little biscuits on top - not the crispy crust one would expect. Grandson had beef stew which he called flavorless. I won't go back and would not recommend this restaurant, sadly. Good enough to eat Is always great in every way! The food, service, and atmosphere may be matched by a few other superior restaurants in Manhattan,but never exceeded! And quite frankly, we are very often fortunate enough to be served by our all time favorite waiter, Theron, who is simply the best!!!!! May Good enough to eat and Theron thrive and be blessed for many, many years to come!!!!!! The food was great and our server was very attentive, but it took FOREVER to get our meal. Had never visited during the very popular brunch weekend times, and instead visited during weekend dinner. It was fabulous. Generous portions, and all quite well seasoned, prepared and presented. Delicious! Had the salmon entree, hubs had the chicken pot pie and little tot had the pea soup. We finished all off with a coconut cake. Great cooking and great food. A place you’re sure to leave satisfied in all ways. Particularly good food (especially the Beer Battered Chicken Tenders and the Buttermilk Fried Chicken) that was served by a particularly charming and friendly waiter named Kevin made for a very pleasant evening. It’s great to have such a reasonably priced, homey restaurant on the UWS. Best UWS neighborhood joint. Have loved it since the 90's. Always consistently excellent! the service is terrible but I read that in a lot of reviews so I guess they don't care. We had a good meal but waited longer for the check! The service was great, but the food was mediocre. The place looks old and tired, seats are not very comfortable, and though we understood after arriving that this was a family-friendly restaurant, the children became rather noisy at times. Excellent food, atmosphere and staff. Will defiantly be returning on our next trip to NYC. Lovely, interesting decor neighborhood restaurant offering casual dining, healthy and comfort food selections...Perfect for a pre-movie dinner. Reservations clearly important as it is a small restaurant and popular for families as well. We had always seen this place passing on the bus or by car...and so glad we FINALLY GOT THERE! We will definitely be going there again to try more! too. A great find - for any occasion. First time here - great comfort food and relaxed atmosphere. Food was very good and portions were generous. We had tried to get into this restaurant on Sunday for lunch but the line went around the corner. We were glad to see that they do allow you to make a reservation for dinner on Open Table. So, we made a reservation for Friday evening. We were delayed in arriving because of traffic coming from downtown. We called twice to let them know and they graciously said no problem. Imagine our surprise when we finally arrived around 7:20PM to find the restaurant virtually empty. Rachel told us that most people just consider this restaurant to be a breakfast, brunch, and lunch place. It is something they are working hard to change. Our server was not as friendly as we would have liked – very little conversation. We liked the idea that everything is made from scratch and sourced from local vendors. They serve up good old-fashioned, comfort food. 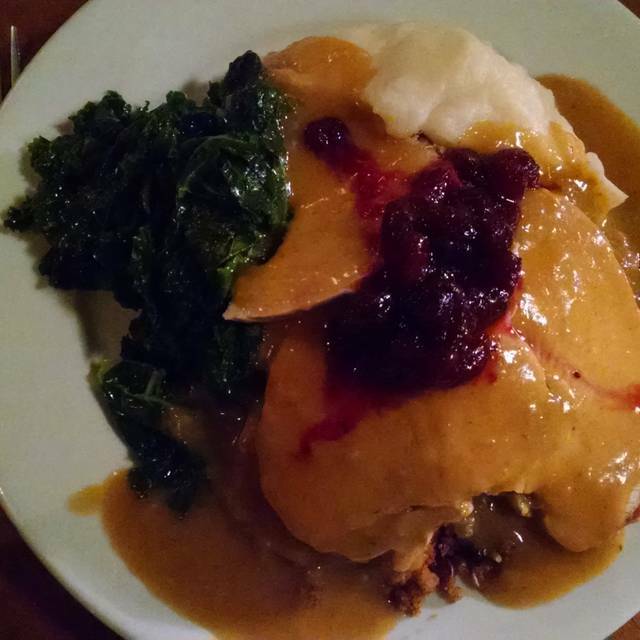 I went with the Traditional Turkey Dinner ($19.50) and boy was it! They served me an enormous amount of roasted turkey, corn bread apple raisin stuffing, cranberry relish, mashed potatoes, sautéed kale and gravy. 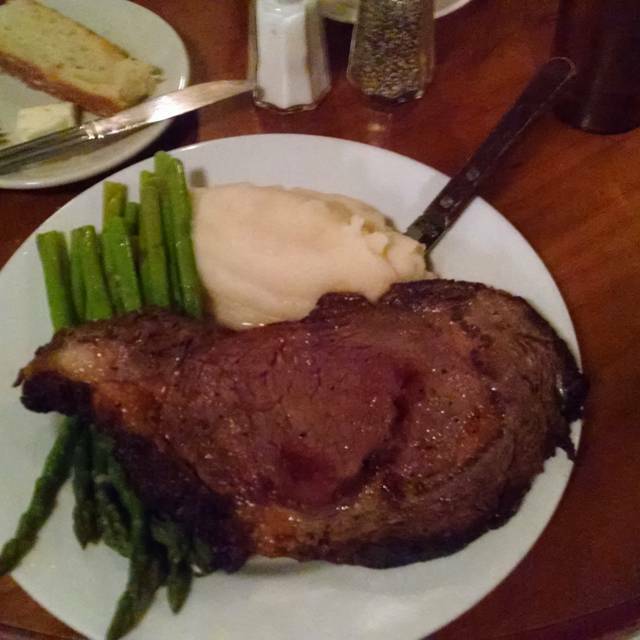 My husband had the special of the evening – Prime Rib ($29.00) served with mashed potatoes and asparagus. He ordered a glass of Chardonnay ($12.00) and a glass of Nero D’Avola ($10.00). 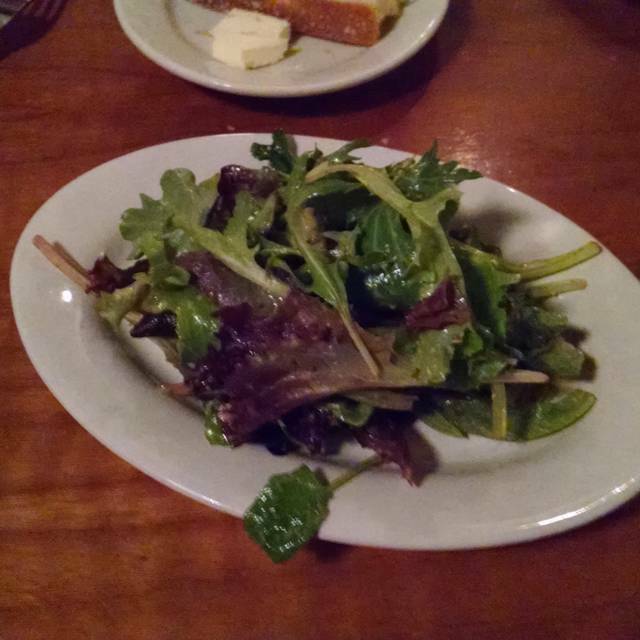 Both entrees included a side salad with house vinaigrette. We both enjoyed our dinners.